Hour by hour the information oozing out of the Middle East shows that Putin, and now Hollande, are willing to do the job that Obama and his coalition are unwilling to do. After yesterday's meeting in Moscow, Putin and French President Francois Hollande agreed that the ‘commercial scale’ oil smuggling into Turkey, currently the primary source of ISIS financing, must be hit first and foremost in order to cripple the terrorist group. “Vehicles, carrying oil, lined up in a chain going beyond the horizon,” said Putin, reminding the press that the scale of the issue was discussed at the G20 summit in Antalya earlier this month, where the Russian leader demonstrated reconnaissance footage taken by Russian pilots. 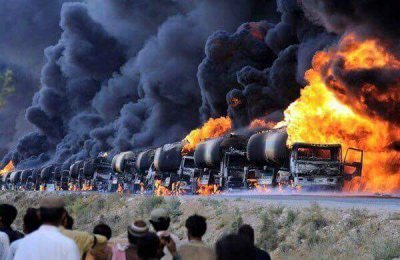 Putin and Hollande reached a consensus Pepe Escobar says: "There will be a barrage of air strikes against the fuel tanker truck convoys transporting stolen Syrian oil across ISIS-controlled territory on the way to Turkey." Adding, "There goes in flames the profitable racket of ‘Sultan’s’ son Bilal Erdogan." Either Turkey, or it's CIA handlers, made a huge miscalculation when they shot down that Russian bomber two days ago. Just a few days ago Turkey's dictator and the CIA were busy raking in big bucks, now the whole dirty deal is being exposed. Months ago Turkey's journalists exposed Erdogan's weapons smuggling to extremist Syrian rebels including The Al-Nusar Front, and ISIS. The story was quickly 'disappeared' when Erdogen's police arrested the reporters, confiscated the evidence and charged them with being traitors. 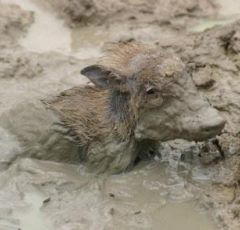 But today it re-surfaced at ZeroHedge. The genie is out of the bottle, the proof of the Turkey-ISIS oil connection is all over the net now. 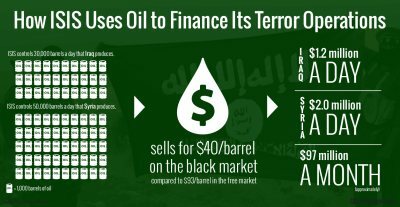 The question now is why, after 15 months of bombing by the US-led coalition have all those sorties [over 1000] not attacked the financial roots of ISIS? Most likely it's because ISIS, like the Al-Nusra Front and the other anti-Assad takfiris, are who the US pins its hopes on to be the ground force that it knows is necessary for any hope of over-throwing Assad to be realized. That plan started to evaporate when Russia called the US Empire's bluff by sending in its Air Force to do the job. Now that Russia is kicking the crap outta ISIS oil to money to arms scheme the US coalition is spinning it's MSM propaganda but Putin has once again trumped Obama with yesterday's agreement with Hollande. The CIA obviously knew all this, it has geostationary satellites sitting over ‘Syraq’ working overtime. So then did the US military and Obama. Now Russia and France are going after all of them; the CIA weapon highway, the Turkish-enabled Jihadi highway, the ISIS-to-Turkey stolen oil highway. 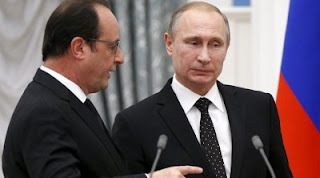 Not only did Russia and France agree to focus on ISIS and Jabhat al-Nusra, a.k.a. al-Qaeda in Syria yesterday, but France also agreed to join Russia in increasing support for the fighters on the ground; which is code for the Kurds. Erdogan, the wanna-be Sultan, made a huge mistake, but, going back to the Canadian angle, Justin Trudeau's decision to get out of the wrong-headed air-farce and instead focus Canada's efforts on expanding the training of the Kurds looks smarter everyday.